A drove of pigs, a romp of otters, an ostentation of peacocks, and a tower of giraffes. . . . 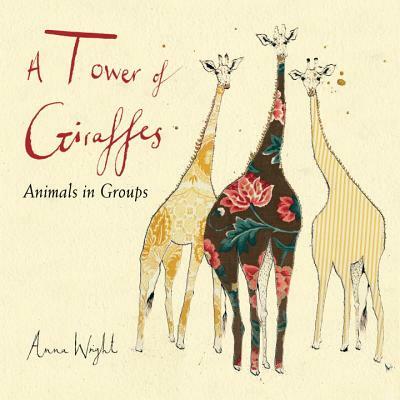 This clever book introduces young readers to some of the words we use to refer to animals in a group. The ink, watercolor, and fabric collage art is brightly colored and uniquely sets this fun book apart from the crowd. Each page presents information about an animal and its group behavior, such as how geese fly in a V-shape and honk to encourage the leaders, and that sometimes tens of thousand of flamingos meet up in one location. Young readers will have a great time and create a wellspring of new vocabulary words. Anna Wright's rural upbringing in Scotland introduced her to nature, and her interior-designer aunt inspired Anna's love of fabric and wallpaper. She graduated from Edinburgh College of Art and uses her artistry to great effect on merchandise and in her original works and prints. Her work has been featured in House & Garden, Country Life, and Artists & Illustrators. This is Anna's first book. From a gaggle of geese to an ostentation of peacocks, a gathering of collective nouns. A brief forward introduces the idea that all animals "have varied social lives, family systems, and living situations," ending with the note that "Maybe animals aren't too different from people, actually." Indeed, as each animal group is highlighted, readers learn that koalas are mostly solitary, penguins "love being together," and female giraffes "make friends and avoid the giraffes they don't get along with." The tone is conversational and sometimes witty. The art is spectacular: exquisite pen-and-ink drawings that capture collective animal personalities, filled with either masterful watercolor washes or carefully selected scraps of fabric and wallpaper. Some feathers have found their ways onto the birds, too. The drollest spread features sheep, gazing blandly at the reader, their coats showing patterned knits, some of which appear to unravel off the page. The text mentions how, when threatened, they will "run swiftly in a wild and woolly whirlwind." The sole disappointment is the lack of a solid ending to the book, especially considering the strong preface. After learning about the peacock's loud call, readers turn the page to animal-adorned endpapers. This brief, exquisite overview may well have readers wishing for a sequel—or consulting reference books to find out more collective nouns. Sixteen groups of animals—including geese, squirrels, elephants, and pigs—appear in fanciful ink and watercolor illustrations that incorporate textile and feather embellishments. First-time author-illustrator Wright lists the collective noun for each subject, then offers brief, often alliterative descriptions of the animals: "If danger comes too close, the sheep run swiftly in a wild and woolly whirlwind to get away." (Fittingly, her sheep are covered with woolen knit textures, complete with unraveling threads.) Elsewhere, a flamboyance of pink flamingos steps gracefully like ballerinas, a troop of four monkeys peers out from the page with inquisitive expressions, and a prickle of hedgehogs is outfitted with floral and abstract patterned prints. A visually expressive take on collective nouns. Employing a clever combination of ink, watercolor, and collage (materials include fabric and feathers), Wright presents 16 examples of collective noun designations for different animals, such as a mischief of mice and a prickle of hedgehogs. Readers also learn a bit of information about each creature: for instance, within a drove of pigs, some will “sleep beside the same companion for many years,” and though monkeys live in troops, they are often hostile to outsiders. The charm of this book is the use of different media for the collages. The sheep’s bodies are made of pieces of wool sweaters, while the penguins’ bodies resemble upholstery fabric or decorative wallpaper designs. With tiny strokes of black ink, Wright has added details to each animal, creating whimsical and endearing facial expressions. Though Woop Studios’ A Zeal of Zebras: An Alphabet of Collective Nouns (Chronicle, 2011) contains a lot more material, features equally enchanting artwork, and covers more creatures, Wright’s title will also please young animal lovers. VERDICT A solid addition.